Washington is an Amtrak intercity train station in Washington, Missouri, United States. The brick station was designed for the Missouri Pacific Railroad by the railroad's Chief Engineer E. M. Tucker and built in 1923. The wooden depot built in 1865 which it replaced was moved and became the Missouri Pacific freight station. Both stations still stand. ^ "Amtrak Fact Sheet, FY2017, State of Missouri" (PDF). Amtrak. November 2017. Retrieved 1 January 2018. ^ Jones, Maureen (1986). "Historic Survey of Washington, Missouri" (PDF). 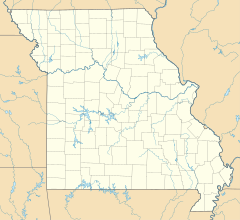 Missouri Department of Natural Resources. State Historic Preservation Office. Retrieved July 24, 2016. This Missouri train station-related article is a stub. You can help Wikipedia by expanding it.